In 1994, Dr. Rory Cooper founded the Human Engineering Research Laboratories (HERL) to help advance assistive technologies for people living with spinal cord injuries. 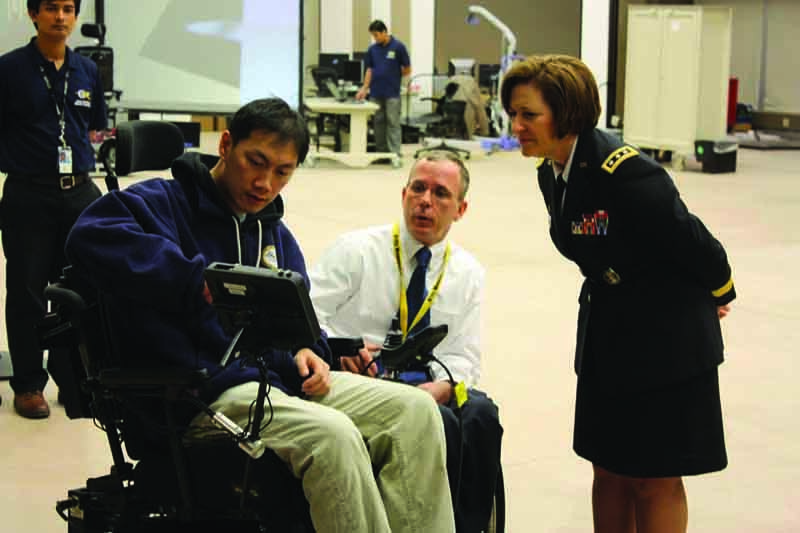 Today, the research organization is located at the University of Pittsburgh, Pa., and it serves as a Department of Veterans Affairs (VA) Center of Excellence in Wheelchairs and Associated Rehabilitation Engineering. Cooper is himself a U.S. Army veteran with a spinal cord injury and a director of the Paralyzed Veterans of America Research Foundation. He currently serves as a member of the U.S. Secretary of Veterans Affairs Prosthetics & Special Disability Programs Advisory Committee, U.S. Department of Defense (DoD) Health Board Subcommittee on Amputation and Orthopedics, and the Board of Directors of Easter Seals. Besides his lengthy professional résumé, Cooper was a bronze medalist at the 1988 Paralympic Games, held in Seoul, Korea. He was on the steering committee for the 1996 Paralympic Scientific Congress held in Atlanta, Ga., and was the Sports Scientist for the 2008 U.S. Paralympic Team in Beijing, China. What inspired you to found HERL? Dr. Rory Cooper: It was the recognized need for a center that focused on wheelchairs and other related technologies for veterans and other people with severe disabilities. In my own background, I’m an Army veteran with a spinal injury and I use a manual wheelchair myself. Given my background in engineering and being a wheelchair user, it seemed to be an area where I can contribute the most. That seemed to also be an area where the VA had a significant need. What was wheelchair technology like 20 years ago? Well, 20 years ago there were only a few manufacturers or distributors of wheelchairs in the United States. Ultralight manual wheelchairs had become commercially available, but there were relatively small numbers in the market. It was largely dominated by what we call lightweight wheelchairs, which are semi-adjustable hospital-like wheelchairs. Powered chairs were essentially manual wheelchairs frames that folded. In a few cases, there were a few rigid wheelchairs that were converted to power. Large 20-inch wheels, caster wheels – they didn’t really have a concept of a power base, it hadn’t been introduced at that time. The controls were largely analog instead of the digital or programmable ones we have today. There were very few interfaces for users, so a limited population could use a power chair effectively. In manual chairs, we didn’t know very much – really anything – about optimizing the manual wheelchair seating system for propulsion and reducing repetitive strain injuries like carpel tunnel syndrome and rotator cuff injuries. Backrests were often slings, not adjustable backrests, and they were often too high for users. There was very little thought given to customization as well. We’ve learned a lot in materials, in controls, in ergonomics, in mechanics, in customization, parametric design, and, in some cases, even moved toward rapid prototyping. Twenty years ago, we were just at the edge of the concept that wheelchairs needed to be fitted to an individual. What are the top three innovations between a manual wheelchair of 20 years ago and a manual wheelchair of today? That’s a good question. I would have to say, in no particular order: One would have to be the knowledge of the ergonomics of manual wheelchair propulsion; probably under that would be how the wheelchair is set up: the ergonomic push rims and the balance of the wheelchair. No. 2 would be the transformation of seating for ultralight manual wheelchairs. The third breakthrough would have to be in the materials used in manual wheelchairs. What are some of those breakthroughs in the materials in manual wheelchairs? I think the greater use of composites of carbon fiber, Kevlar®, high-strength aluminums, titanium, and those sorts of materials. Most of the wheelchairs 20 years ago were either made of steel or basic aircraft aluminum. [These materials have improved] the weight, but it’s improved the rolling efficiency and the reliability of the wheelchairs as well. Components are both stronger and lighter.